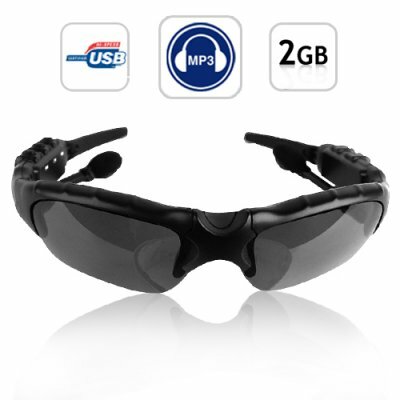 Successfully Added WMA + MP3 Player Sunglasses 2GB - Stereo Sound Effect to your Shopping Cart. MP3 music player sunglasses. Looking cool is what all men are about, so why not do it in style? Now you can, with these hot MP3 Player Sunglasses with 2GB's of memory. These WMA + MP3 player sunglasses come with 2GB of flash memory (enough to store a large music collection) and provides you with exceptional stereo sound effect through the built in high quality earphones. Simply put it on, and presto, this cool looking MP3 shades will provide you with the flexibility of listening to you favorite music with style, convenience and ease. Designed with the user in mind, this MP3 sunglasses comes with a swiveling and extendable earphones meaning they will fit virtually any adult. Furthermore, with the flip up glasses design, you won't even have to take the sunglasses off in low light situations. These sunglasses also includes a hard case and lens care cloth, so keeping your sunglasses in great condition and easy to find has never been simpler. These popular WMA + MP3 sunglasses are available in stock now, and is the perfect product or resellers and drop shippers. Click "Add to Cart" now and let us express ship you a sample to see for yourself the amazing awesomeness of these super cool high tech sunglasses. Then list them on your webshop using your own experience as a firsthand review of how good the product really is! how do I load my music onto the MP3 player sunglasses? It's simple, just use the included USB cable and transfer your digital Music files straight from your computer onto the MP3 sunglasses. Does this model also come with Bluetooth? No, for Bluetooth enables MP3 sunglasses, please check out our other MP3 + Bluetooth sunglasses, product code CVDLZ-10MY-2-BLACK. war nach 20 min. mit 1.4 giga sound geladen! Wie immer perfekte Artikel! For this price I was not expecting too much from the player, a cheap amp and the cheap headphones that are normally available in this price range. I was very wrong! For a set of out of ear headphones (full stereo, not stereo effect as advertised) the sound quality was unexpectedly good - very little distortion, very low noise, excellent frequency seperation and adequate bass response (remembering this is not an enclosed system). In the past I've paid far more, and recieved far less - good job! The glasses themselves are budget but functional, though coupled with that sound system I know my cycle commute to work has just become far more enjoyable. From me, 5 stars based on value and sound alone.